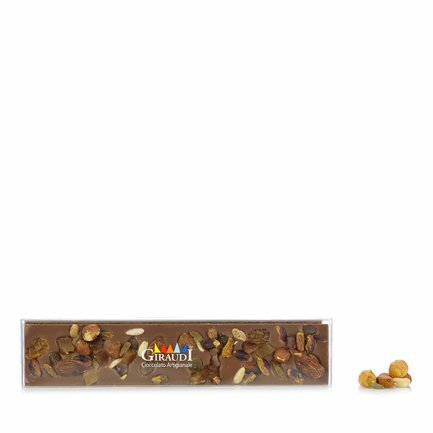 Bar of extra fine chocolate packed with delicious nuts and candied fruit. Ingredients Milk chocolate (sugar, cocoa butter, whole milk powder, cocoa mass, emulsifier: soya lecithin, natural vanilla, cocoa min. 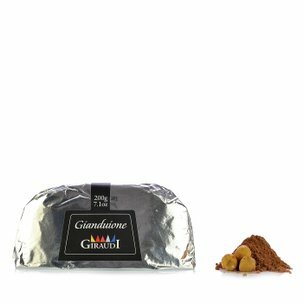 35.6%), Piedmont hazelnuts (25%), almonds (25%), Pisa pine nuts (25%), Bronte pistachios (25%). ALLERGENS: may contain traces of: nu For more information on product labels, please contact our Customer Service department. The information on the labels of the products may vary for reasons beyond our control, therefore, there may be discrepancies between the information on the site and that on the products delivered. Please always check the information on the product before consumption or use.